The simple explanation behind Graeme Jones’ shock decision to end his successful partnership with Roberto Martinez – which was born in Wigan in the 1990s – over the summer. Jones will this weekend make his first return to Wigan since leaving in 2013, as part of the West Brom coaching staff. His decision to leave his role as Belgium assistant manager – under Martinez – came as a huge surprise to those who thought the pair would always stay together. Jones, though, says the pain and heartache of being so far from the family home in Appley Bridge meant he had to make the difficult – but ultimately correct – decision. “You’ve got to remember I was living away from my family for two years, over in Waterloo,” he told the Wigan Post. “I just didn’t want to carry on like that, living away from home and my family. “My boys were at an age where my wife couldn’t just leave them, and it meant I didn’t see much of them for two years. “That was the biggest reason – the only reason really. “I still love Rob to bits, I spoke to him the other week for about 45 minutes, and nothing had changed. “He’s very happy over there, really enjoying his job, has a great lifestyle, good way of life. “But he had his family with him, and I didn’t – and that’s the top and bottom of it. “Nothing else changed, personally or professionally...I just wanted to see more of my family. Jones and Martinez were only in charge of the Belgian national side for two years, but the remarkable run to the last four of the World Cup generated a lifetime’s worth of happy memories. “The two years were quite simply the experience of my life,” Jones admitted. “To beat Brazil in the quarter-finals of the World Cup, and experience a semi-final against France and then a third/fourth-placed play-off against England...that’ll live with me forever. “We all went through so much to achieve what we did...I lost my father three months before I took the job. “I went through all that on my own, living on my own in Belgium, which made it tougher. “For the two years to culminate in us getting to a World Cup semi-final...and I wouldn’t have wanted to go through it with anyone else other than Rob. “We’ve certainly come a long way since we were thrown together at Springfield Park! “But just as Wigan Athletic hasn’t changed over the years, I don’t think we have either. 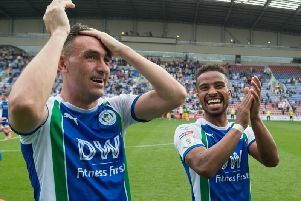 “Just as Wigan is my club, it’s also his club...and it’s hard to explain for people who don’t understand the football club. “They don’t get it, they don’t understand it. Not that Jones, the professional, will have split loyalties when the whistle goes at 3pm. “I love Wigan, Wigan’s my club, that’ll never change,” he acknowledged. “But the industry we’re in, it’s only ever about the three points on the day. But is he looking forward to the inevitable hero’s reception waiting for him? “I’ve honestly not given any thought to the reception I’ll get,” he added.